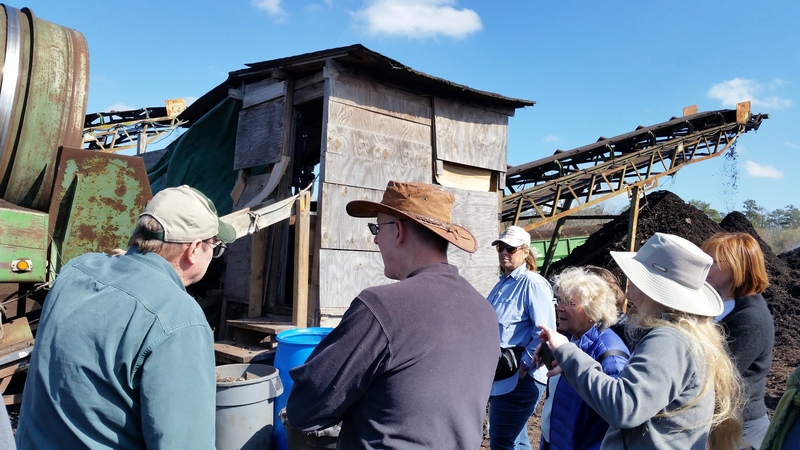 Last Saturday the Heights Garden Club toured the compost, mulch and soil making facilities of Nature’s Way Resource Center. 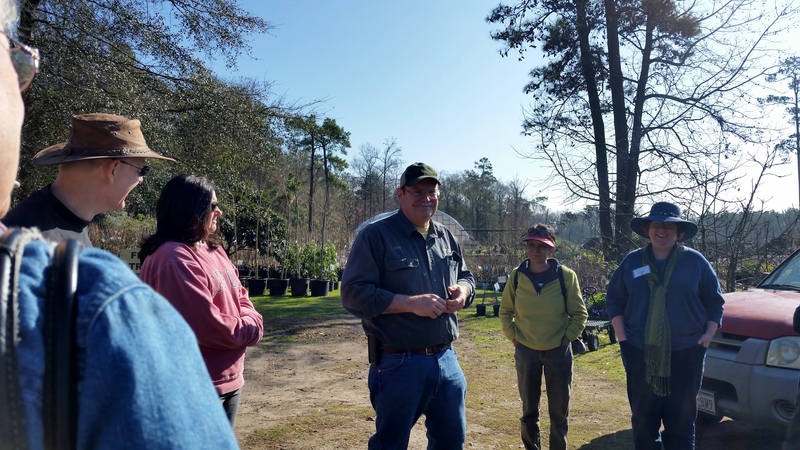 Owner and local soil hero John Ferguson lead us on a fascinating tour. He has a background in science and is a licensed soil scientist in the state of Texas. We were there two hours and the time just flew by. Everyone there was just as fascinated as we were! We gathered in the parking lot to start our tour. 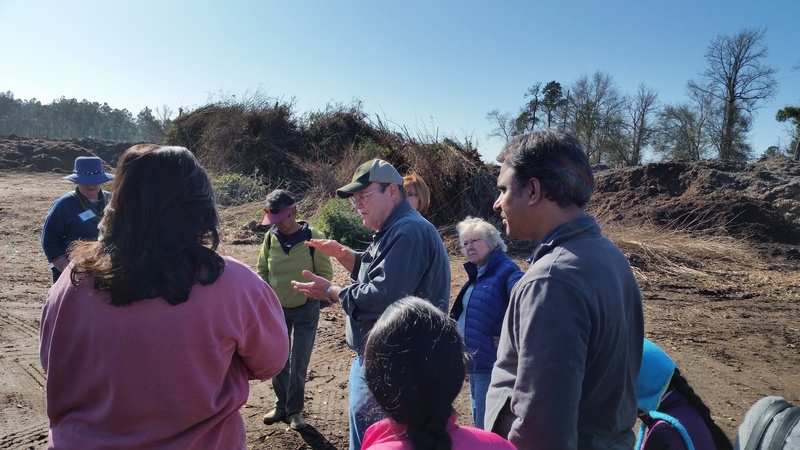 John told us the story of how he came to be in the business of making mulch, compost and soil. It was truly the realization of a childhood dream. He had a reoccurring dream of sticking his hands in to big piles of stuff that was steaming. But he never understood what it meant. When he went to college the dreams stopped. A few events lead to his deciding to leave the oil industry and turn his passion for gardening into a business. And ultimately starting his company Nature’s Way evolved out of these series of events. One was an allergic reaction to a common fungicide that almost cost him his life. It took him six months to recover from the damage it did to his body. This is when his dream came back and he felt lead by God to change his life. The scientist in him studied new methods of horticulture and agriculture. He found that using organic materials actually worked better and cost less than the commonly accepted chemical methods. So in the early 90’s John left the oil industry and started a landscape company. His goal was to provide landscaping that was low maintenance and environmentally friendly. 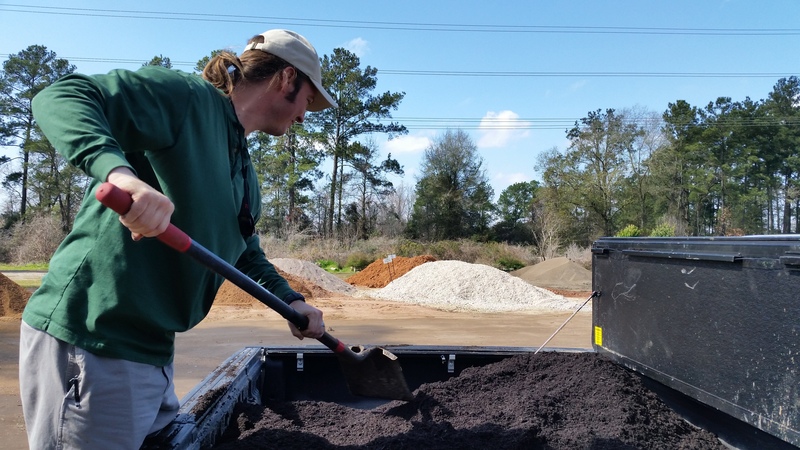 He needed organic mulch and soil but wasn’t able to find anyone in the greater Houston area that supplied quality mulch and compost. 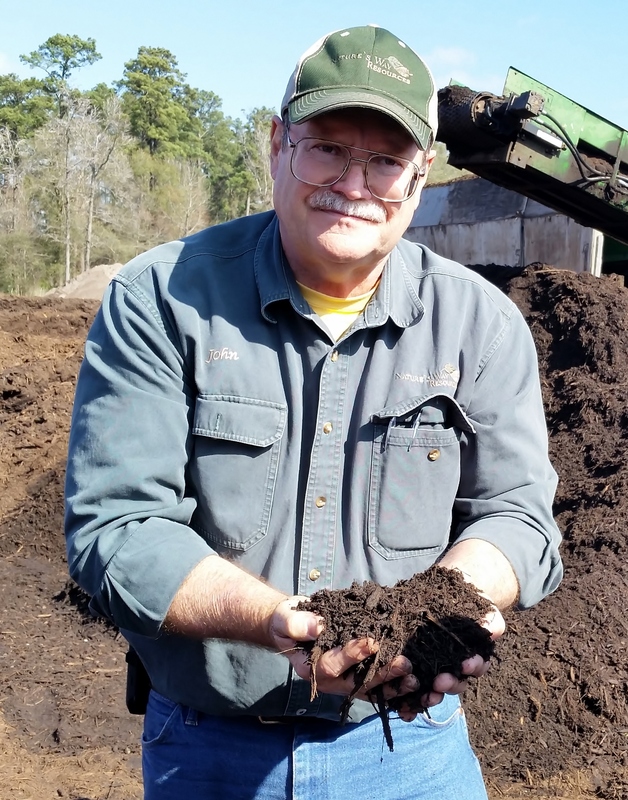 John researched everything he could find on compost technology and what it would take for him to produce a few thousand cubic yards of compost he needed for his landscaping company. It was then that his dream started to make sense. 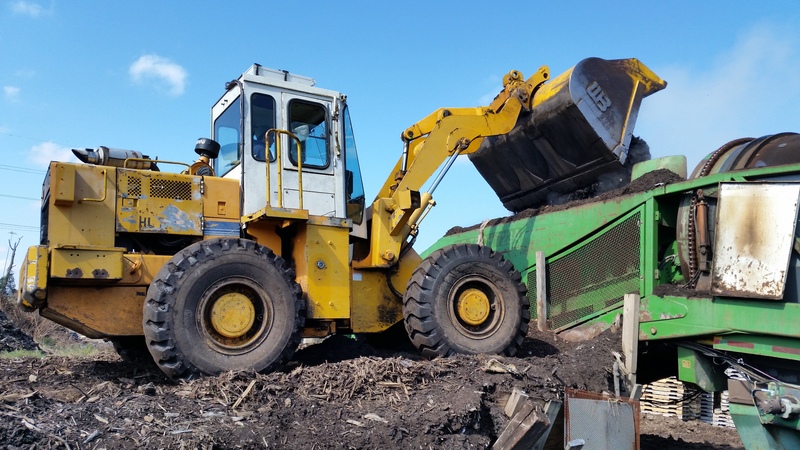 He saw there was a need in our area for a good reliable source of organic mulch and compost on a large scale. So he closed down the landscaping business and started Nature’s Way Resource Center. 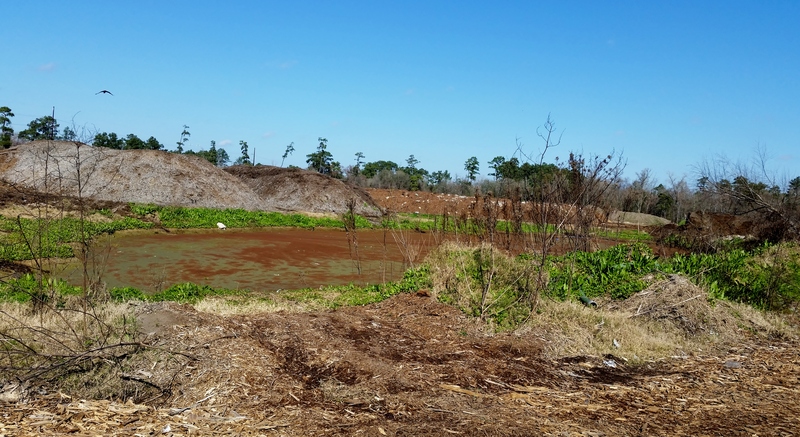 The company now sits on 40 acres in the south end of Conroe. To read more about his story you can go to the Nature’s Way website. He told us so many interesting facts but I didn’t have time to record them all. One thing I found interesting is the soil in our area is high in sodium and mounds of it push up through the soil. He is very careful with what he uses to make his mulches and composts. He doesn’t use cow manure because it is high in antibiotic. No chicken manure because it is high in salt and our soil has too much already. Also arsenic is used for many chickens to shorten their ‘finishing ‘ time but this is carcinogenic to humans. 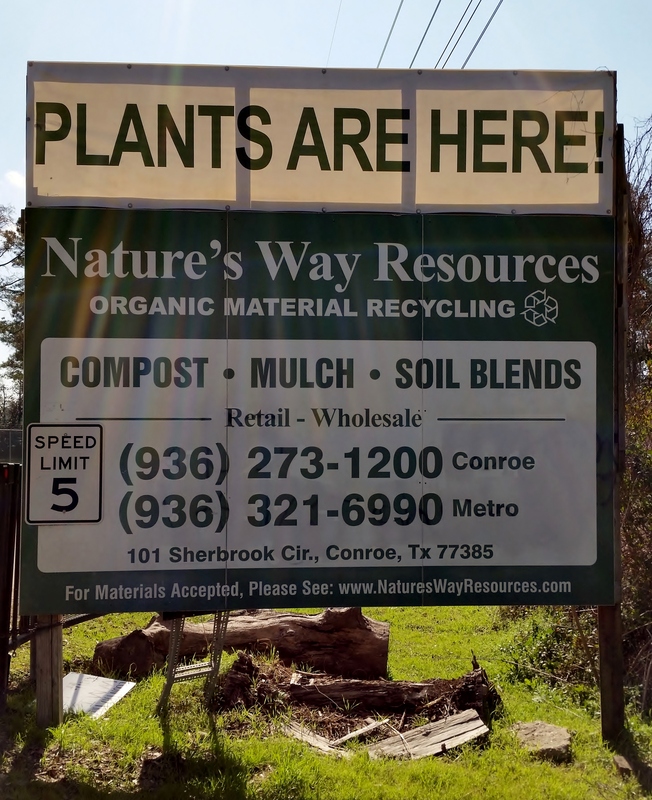 At Nature’s Way you can find other materials in addition to compost. 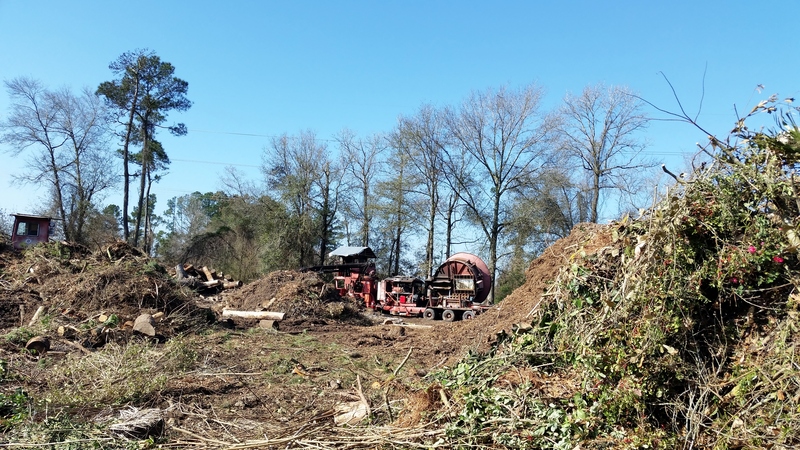 Nature’s Way has a contract with the Woodlands Township to take all their green waste. There was a problem with yard bags and plastic plant containers but that was resolved. 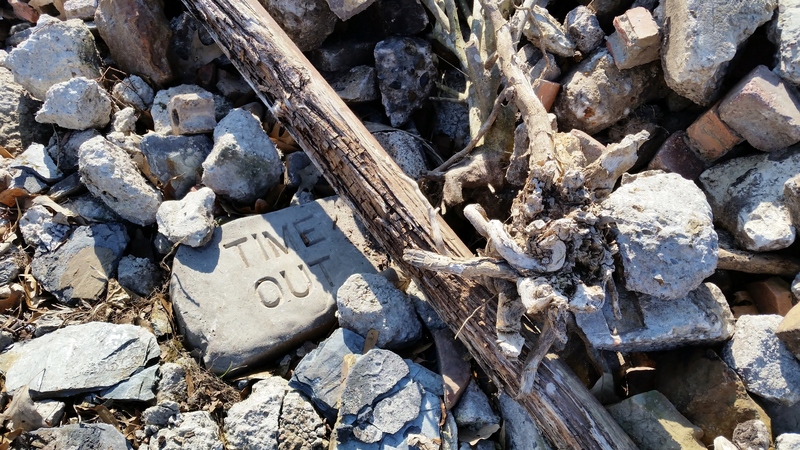 Everything was well marked with what it is and the date it started. 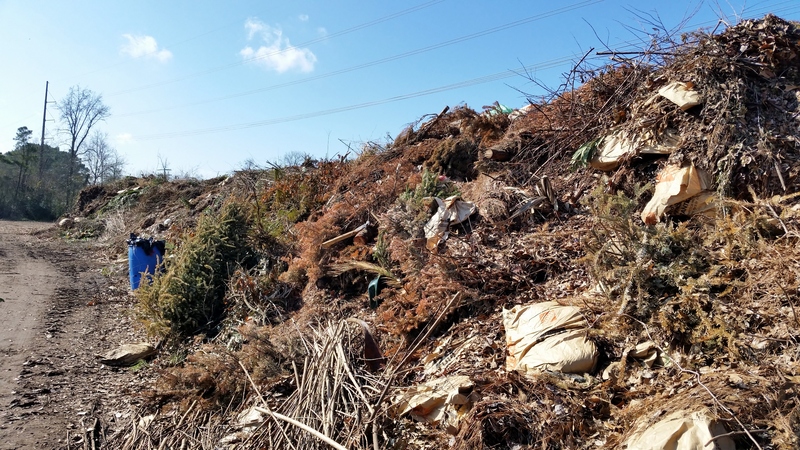 The leaves and grass are saved to use in compost. They moved to this property in 2004 and built it up with 4′ concrete to keep his processes out of the water table as well as providing a stable base. On the southwest side he built it up to keep freeway debris from washing in. They have two grinders, one is awaiting repair. These grinders cost around 1.2 million dollars! 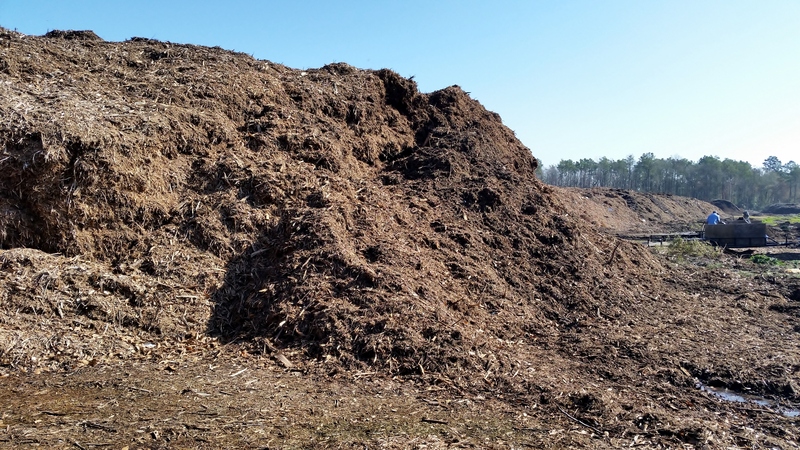 They make several different kinds of mulch. 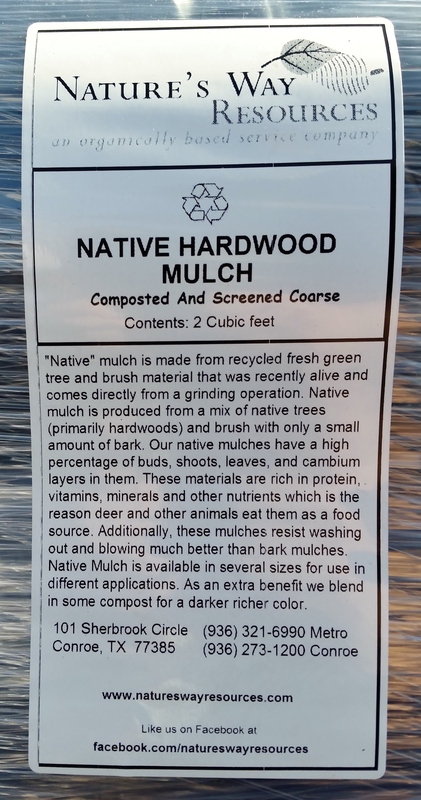 Native hardwood mulch, a mix of native deciduous trees combined with brush and a bit of bark. The big logs are saved for the playground and path mulch becasue they are too rich in carbon. For garden mulch they use the smaller branches and shrubs that are high in nutrients. It encourages beneficial microbes and earthworms in the soil. 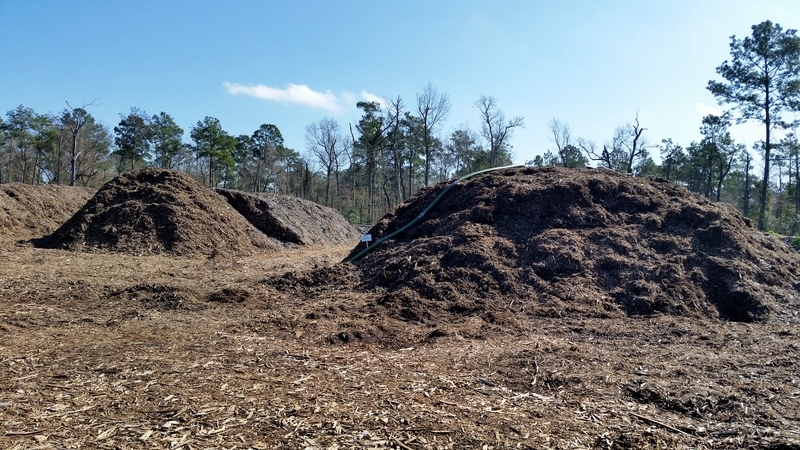 We like shredded hardwood mulch because it stays in place better during wind or rain events that bark mulch. It is available in several sizes for use in different applications. 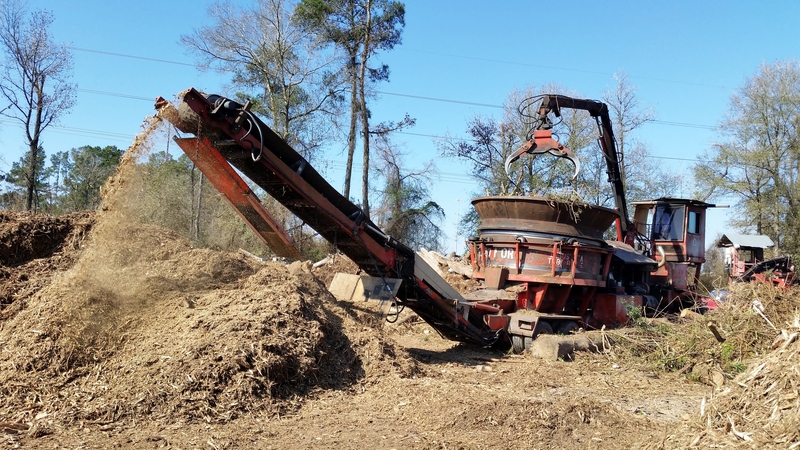 There is Aged hardwood mulch which has gone through the composting process. This helps kill weed seeds and pathogens and stabilizes the nitrogen in to a form that is beneficial to the plants. 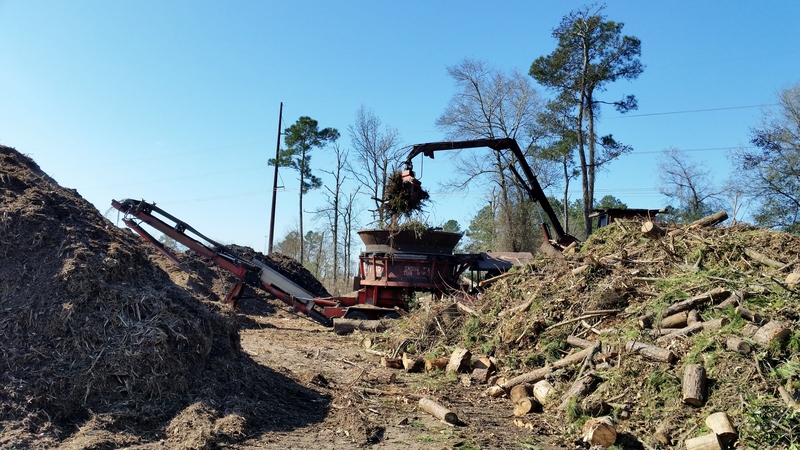 There is a Double Ground mulch, Native Fresh Double Ground, Azalea mulch (it has Texas Green sand to increase the iron and other nutrient content and then add sulfur to increase the acidity that azaleas require), Playground and Path mulch, Fresh Ground and Utility mulch. Almost had the feel I was at Starbucks ordering coffee! 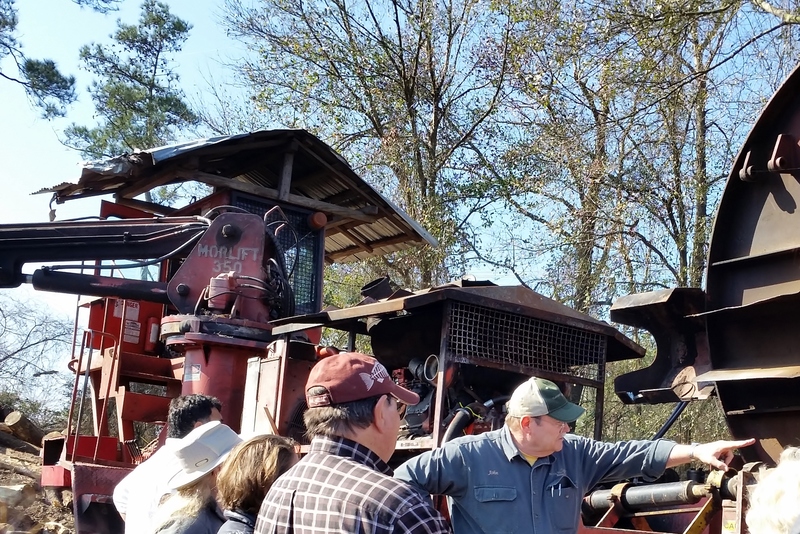 John told us how this machine works and how expensive the parts are when it needs repairs. It is amazing they can make money. But I know people come from far and wide to get this excellent mulch and compost! 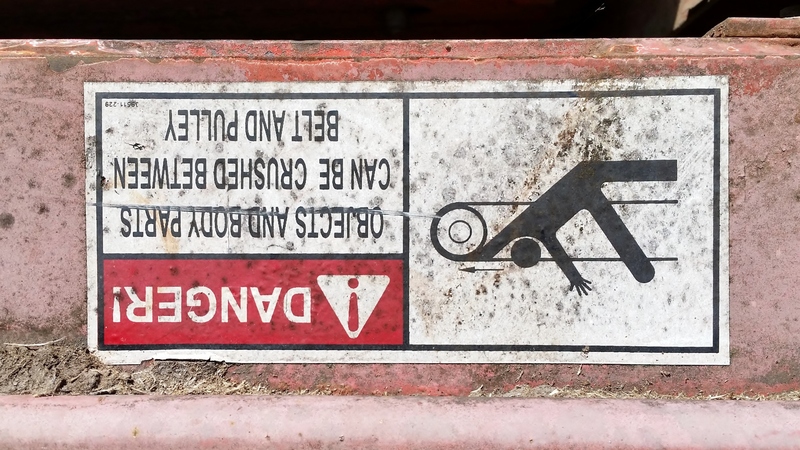 I liked the upside down sign! When this grinder is operation the big disc is parallels over the grinding tongs. Like the one you will see in a few pictures below. 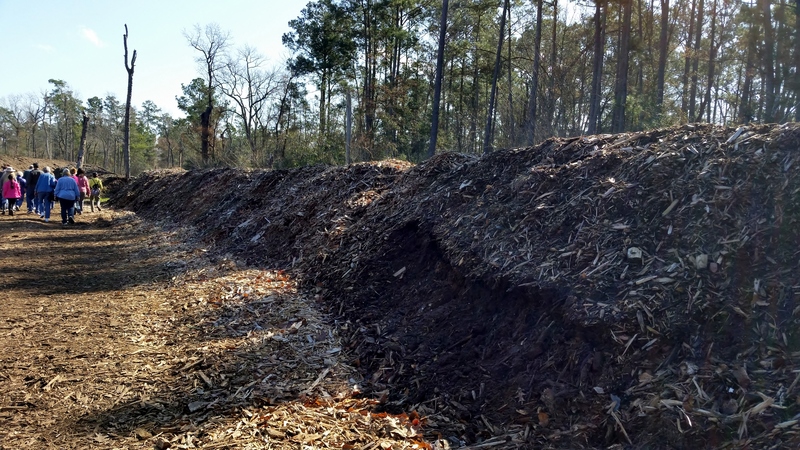 A pile of shredded mulch. 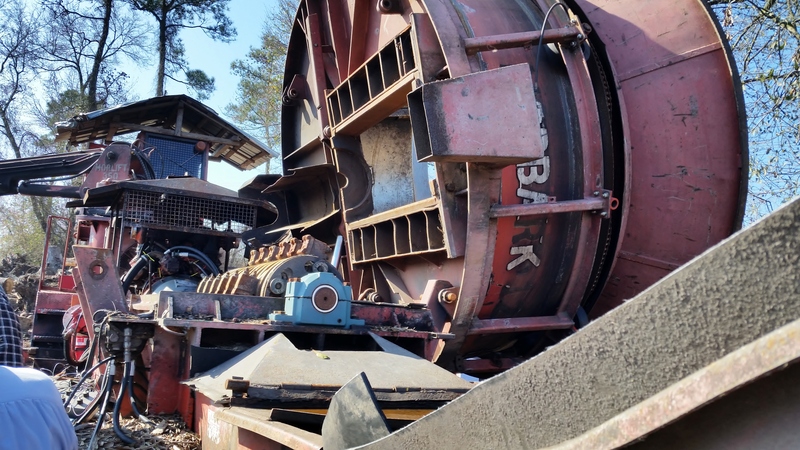 This grinder was operating and they can move a lot of debris quickly with it. 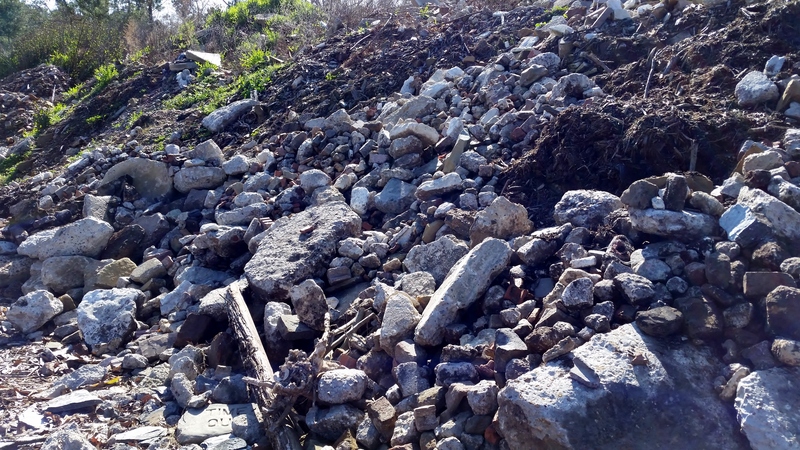 They have a place where landscapers can dump old materials and make it available for homeowners to pick through it and re-purpose it, free of charge. This is also the beginning of a wall that helps keep ATV’s and neighboring kids off the property. This is a border berm that is also breaking down and will be used up and replaced. There were mounds of compost and mulch everywhere. 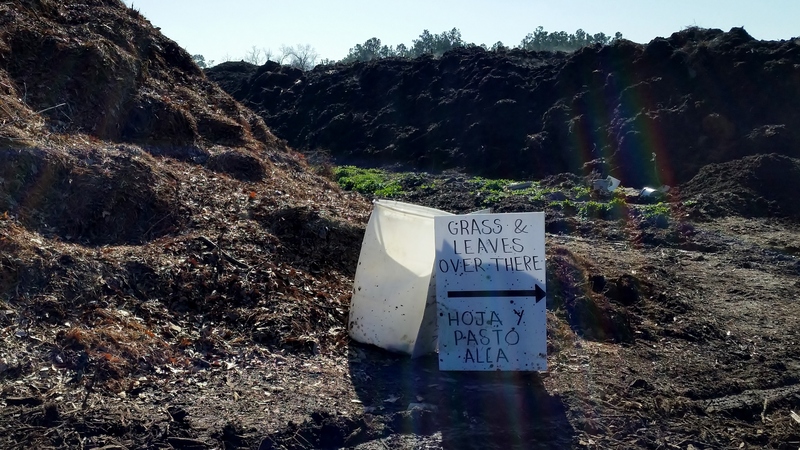 They have Leaf mold compost – made with leaves, some grass, and horse manure. It is aged slowly to breakdown the leaves until it is a rich humus. It is a great amendment for flower beds, vegetable beds and lawns. It comes in different sizes for different purposes. 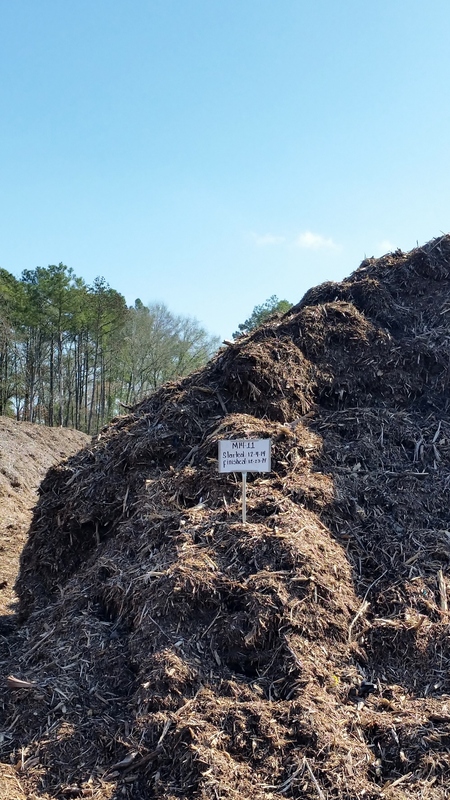 And they have a Fungal compost – it is similar to the native mulch but it has been composted for a much longer time and screened finer for a more uniform texture. It is suggested for shrubs, trees, roses, and other perennials. They have other ingredients that are add to increase the richness and help in the composting process. The also have a variety of soils that are specially formulated for every manner of use. I need to go back and get some of their seed started mix. And you can buy sand, gravel and soil amendments there too! Giant sifter with various screens for different sized pieces. Shed where sifter control panels are located. Once they only sold wholesale but now they bag their mulch, compost and soil and sell it at retail centers all around town. Some nurseries have their own special blends made up to work with their specific area. Next week we are going to Arbor Gate Nursery up in Tomball and they have Nature’s Way products. 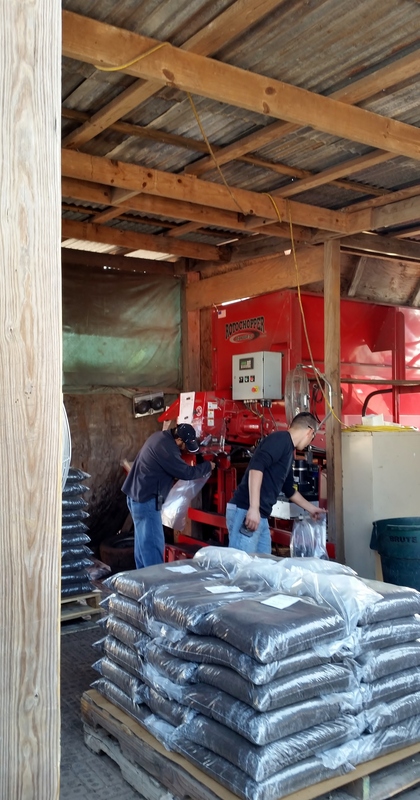 One of our favorite growers here in Houston, Treesearch Farm’s, uses Nature’s way products in there growing operation. While there we saw them bag up a soil mix for Maas Nursery which is right off the bay. Living near the gulf on an alluvial plain, with our big swings in temperatures, is very challenging for many plants. Our clay is rich in nutrients but not in a form that the plants can access. It can easily become hard and anaerobic. This is what makes having healthy soil so important. We need the soil to be teeming with life so that it can break down our clay into forms available to our plants. It was an amazing operation. 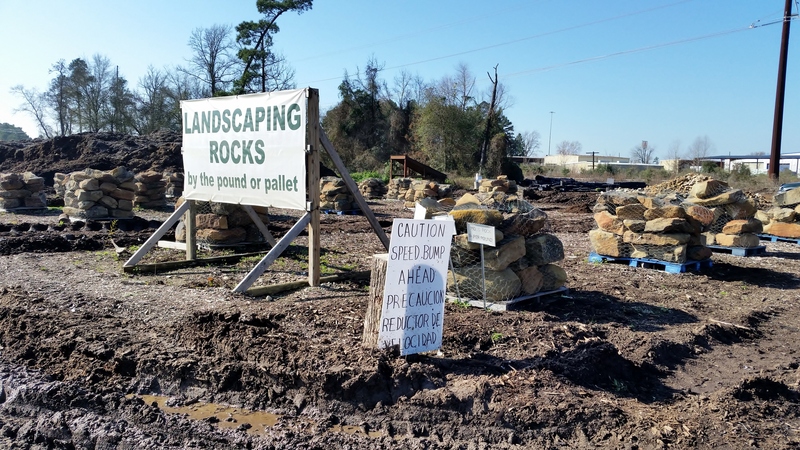 Recently they have taken 10 of their 40 acres and are turning it into a plant nursery and demonstration garden. And we went home with a yard of shredded leaf mold compost for our beds here at Ravenscourt Gardens. Truck bed filled to the brim and yes that is Shawn shoveling it flat. Thank you John for an excellent tour! Here is a great video with more information! And for more in-depth information on soil science there are great articles archived on the Nature’s Way website. And John recommend the book Teaming with Microbes: The Organic Gardener’s Guide to the Soil Food Web by Jeff Lowenfels and Wayne Lewis. He is a very special man!